For the commemorative stamps of Italy, the HUGE event of 1937 was the celebration of the 2,000th anniversary of the birth of the first Roman Emperor. What really was his name? Poor Gaius Octavius, oh what we've done to his name over the centuries. It's time for some Latin --> English semantics instruction here. The first Roman emperor, one of the greatest men that has ever lived, has often been referred to as either Augustus or Octavian. Augustus was one of his imperial titles. Octavius was his family name. Later, Caesar became his family name. To address him in that manner would be very rude. The proper English form of address might be Mr. Octavius or Mr. Caesar. Here are some definitions of frequently misused Latin words. Augustus (Adjective) - can mean majestic, grand, stately, or venerable. In the republican period, this was a word describing one's character. In the imperial period, this was one of the titles used by the emperors. Caesar (Noun) - doesn't mean anything. It is the family name of Gaius Octavianus' uncle, the dictator at the end of the Roman Republic, Gaius Julius Caesar. In the imperial period, this was the title of the heir to the imperial throne, or what we might call the "crown prince". Imperator (Noun) - can mean emperor, commander, ruler, lord, chief, captain, etc. In the republican period, some outstanding military commanders were awarded this title. In the imperial period, this was one of the titles of the emperor. So, Augustus Caesar or Caesar Augustus, as he is sometimes called, actually means The Venerable Mr. Caesar, or maybe at least The Venerable Prince, in later usage! Alas, what can we do? Civilization has had over 2,000 years of practice in calling this great man a number of erroneous names. 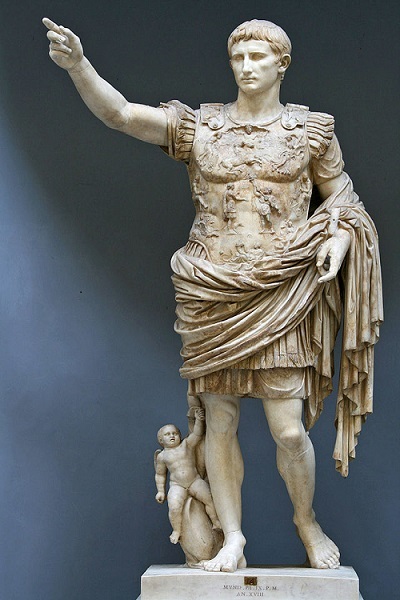 Thus, as much as it irks me, I will call the first Roman Emperor "Augustus" for the remainder of this article! The fifteen stamps of Italy shown above (Sc. #377-86, #C95-99) were issued on September 23, 1937 to celebrate the 2,000th Anniversary of the Birth of Gaius Julius Caesar Octavius, known as Caesar Augustus, the first Roman Emperor. 10 C. - Rostral column or Naval victory column. Mare pacavi = I freed the sea from pirates. 15 C. - Army trophies. Bella terre et mare toto in orbe terrarum saepe gesse victorque omnibus = I waged wars against all the countries all over the world and was victorious on land and sea. 20 C. - Augustus offering a sacrifice. Templa deum in urbe refeci = I rebuilt the temples in the city. 25 C. - Roman standards. Censum populi egi = I have done a census (of the Roman people). 30 C. - Julius Caesar and the Comet. Coepta profligataque opera a patre meo perfeci = I have perfected the works begun and almost completed by my father. 50 C. - The acclamation of Augustus. Iuravit in mea verba et me ducem depoposcit = They swore an oath of allegiance to me. 75 C. - Conquest of Ethiopia. Meo iussu et auspicio ducti sunt exercitus in aethiopiam = By my order the armies were led into Ethiopia. 1.25 L. - Symbolizing the maritime glory of Rome. Classis mea per oceanum = My ocean fleet. 1.75 L. + 1 L. - The Ara Pacis (Altar of Peace) - Aram pacis augustae senatus pro reditu meo consacrandam censuit = The senate voted for the consecration of the altar of peace upon my return. 2.55 L. + 2 L. - Capitol. Laurum de fascibus deposui in capitolio votis solutis = Having fulfilled my vows, I deposited the laurel from my fasces in the capitol. 25 C. - Agriculture. Tua caesar aetas fruges et agris rettulit uberes - Your caesar provided an abundant harvest in the fields. 50 C. - Commerce. Romulas genti date remque prolemque et decus omne = Glory to the descendants of Romulus. 80 C. - Apollo's steeds. Alme sol possis nihil urbe roma visere maius = Apollo (nourishing sun), may you see nothing greater than to visit the city of Rome. 1 L. + 1 L. - Map and Roman standard. Qui mare qui terras omni ditione tenerent = Those who hold the dominions of the sea and of all the lands. 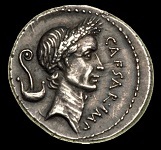 5 L. + 1 L. - Caesar Augustus. Tutela praesens italiae dominique romae = Rome and Italy, the mistress of the world. Gaius Octavius (63 B.C. - A.D. 14) was born into the wealthy Octavi family. Like any aristocratic Roman youth, Octavius was educated in Greek and Latin and trained to be an orator. The 11 year old Octavius made his first public appearance in 52 B.C., delivering the funeral oration for his grandmother, Julia Caesaris, the sister of Gaius Julius Caesar. It was at this time that the young Octavius captured the attention of his great uncle. From 46 B.C. on, Octavius was very close to Julius Caesar, and he was included in many of Julius Caesar's public and military activities. In 45 B.C., Julius Caesar sent Octavius to Macedonia, where he studied military doctrine and tactics. In the meantime, Julius Caesar returned to Rome and filed a new will in the Temple of the Vestal Virgins. In his new will, Julius Caesar secretly adopted Octavius and designated him as his heir. While still in Macedonia, word reached Octavius that Caesar had been assassinated on March 15, 44 B.C., and he became aware that he had been adopted by Julius Caesar and made his heir. From that time, Gaius Octavius' name became Gaius Julius Caesar Octavianus. Following the defeat of the assassins of Julius Caesar, a long civil war ensued over control of the former Roman Republic. At the Battle of Actium in 31 B.C., the legions of Octavius defeated the forces of his last foe, Marc Antony, and as a result, he became the undisputed master of what would become the Roman Empire. He rejected the thought of a hereditary monarchy and of monarchical titles and called himself Princeps Civitatis -- First Citizen of the State. The resulting constitutional monarchy became known as the Principate, the first step in the creation of the Roman Empire. In 38 B.C., he replaced his first name, Gaius, with Imperator, and on January 16, 27 B.C. the senate granted the titles of Augustus and Princeps. Thus began the reign of the first Roman Emperor. 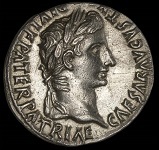 On February 5, 2 B.C., Augustus was given the additional title of Pater Patriae or Father of His Country. To differentiate between his name and that of his step-father, his name became Imperator Caesar Divi Filius Augustus, or "Emperor - Son of the Divine Caesar - Augustus". He has since been referred to as Caesar Augustus or just Augustus. The reign of Augustus began an era of relative peace known as the Pax Romana. Disregarding wars of imperial expansion and a one year long civil war over the imperial succession, the Roman world was largely free from large scale conflicts for more than two hundred years. Augustus dramatically enlarged the Empire, and by the end of the First Century, the Roman Empire included almost all of Europe, Northern Africa, and the Near East. Beyond the frontiers, he secured the Empire with a buffer region of client kingdoms and made peace with the Parthian Empire. He reformed the Roman system of taxation, developed networks of roads, established a standing army, and established the Praetorian Guard. He also created official police and fire-fighting services for Rome, and he rebuilt much of the city. It is said that "Augustus found Rome of brick and left it of marble", a feat that is STILL largely visible around the city of Rome to this day. The reign of Augustus set the foundation for an empire that would last almost 1,500 years, through the ultimate decline of the Western Roman Empire and until the Fall of Constantinople in 1453. Both his adoptive surname, Caesar, and his title, Augustus, became the permanent titles of Roman and Byzantine rulers for fourteen centuries after his death. The ten stamps of Italy shown below are listed as one set of commemorative stamps of Italy, issued on October 25, 1937, called the Centennials set. These stamps of Italy are actually for five different commemorative events, and I have sorted them in that manner for the rest of the text content on this page. The stamps of Italy shown above (Sc. #387, #394) were issued for the 153rd Anniversary of the Birth of Gaspare Spontini. Gaspare Luigi Pacifico Spontini (1774-1851) was an Italian operatic composer. He was popular during his time, but he was largely forgotten after his death. The stamps of Italy shown above (Sc. #388, #395) were issued for the 200th Anniversary of the Death of Antonio Stradivari. Antonio Stradivari (1644-1737) was an Italian maker of stringed instruments, such as violins, cellos, guitars, violas, and harps. Stradivari is considered the greatest artisan in this field. It is estimated that he made about 1,100 instruments in his lifetime, and that about 650 of these instruments survive, with about 500 of them being violins. The stamps of Italy shown above (Sc. #389, #391) were issued for the 100th Anniversary of the Death of Giacomo Leopardi. Giacomo Taldegardo Francesco di Sales Saverio Pietro Leopardi (1798-1837) was an Italian poet, essayist, and philosopher of the Romantic Era. The two stamps of Italy shown above (Sc. #390, #392) were issued for the 101st Anniversary of the Death of Giovanni Pergolesi. Giovanni Battista Pergolesi (1710-1736) was an Italian composer, violinist, and organist. He spent most of his brief life writing and performing for aristocratic patrons. He died of tuberculosis at only 26 years of age. The two stamps of Italy shown above (Sc. #393, #396) were issued to commemorate the 600th Anniversary of the Death of Giotto. Giotto di Bondone (1266-1337) was an Italian painter from Florence during the late Middle Ages. He is considered one of the greatest artists of the early Italian Renaissance. Giotto's masterwork is the decoration of the Scrovegni Chapel in Padua, also known as the Arena Chapel, which was completed in 1305. These frescoes depict the Life of the Virgin and the Life of Christ.